This pub used to be ok, but it's been refurbished. It's painted grey and decorated with framed LP covers. One bar was full of tables laid for food. We sat in the other. The beer was ok. There were no other customers. It was all a bit bland. Probably won't go back. Hatter - you are too kind. Anyone (even visitors from anywhere in the world) should know that you simply DO NOT go into a pub or cafe with a drink purchased elsewhere. The Albert is fine and does not need rude customers who are quick to affix a political label on people. 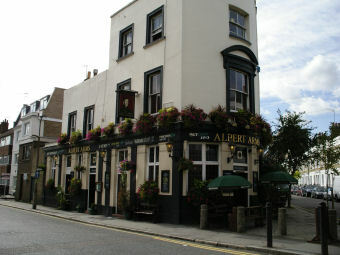 We work across the street from this pub and used to drink there after work a good bit. today one of our staff joined us (we had ll ordered food and drinks) and she was carrying a coffee. The barman got extremely angry, telling our colelageu tog et out. He then became rather xenophobic (only one of us is British and he kept saying 'in my country' this and 'in my country that'), and we all had to leave. He refused to refund the drinks we had to leave standing. for reference this guy said he was the manager. Avoid, if unpleasant BNP attitudes are not what you want over a pint. We will from now on.